from the Archives of Michigan. 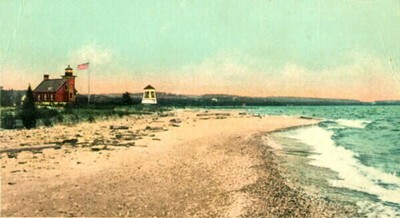 The Little Traverse Lighthouse, also called the Harbor Springs Lighthouse or Harbor Point Lighthouse was first lit in 1884 by lighthouse keeper, Elizabeth Whitney Williams sending light 13 miles across the bay and into Lake Michigan. The lighthouse design is identical to one built in 1883 in Door County, Wisconsin. The two-story brick building with an attached, square tower was an essential navigational tool for vessels on Lake Michigan. 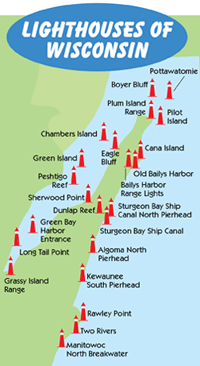 The community of Harbor Springs rallied for several years to get a lighthouse due to increasing boat traffic coming into Little Traverse Bay and Northern Michigan. 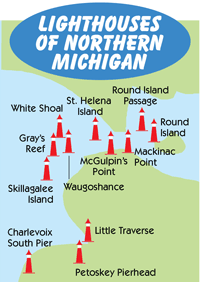 The first lighthouse keeper for the Little Traverse Lighthouse was 42-year-old Elizabeth Whitney Williams. 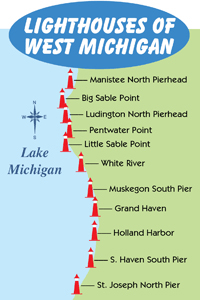 She transferred from a 12-year stint as lighthouse keeper on Beaver Island to Harbor Point. The 40' tower's cast-iron lantern room is 10-sided, has a red roof and a fourth order fresnel lens. A rare, 18' free standing fog bell tower stands next to the lighthouse and was built in 1896 to serve the growing number of pleasure boats coming into the bay and harbor. The 3 1/2 acre property that the lighthouse sits on was purchased by the US Government from the Harbor Point Association in 1883. Also on the property are a summer kitchen attached by a portico and a brick locker. When the US Coast Guard decommissioned the Little Traverse Lighthouse in 1963, the property was sold back to the Harbor Point Association. When the Little Traverse Lighthouse was decommissioned, the US Coast Guard erected a 41' white steel skeleton tower. The light on the tower is visible for 14 miles. 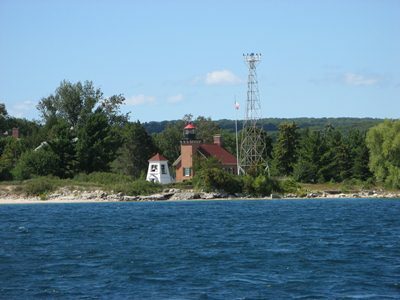 The Little Traverse Lighthouse is not available to the public and can be seen only from the water. 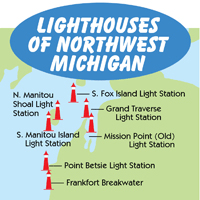 Occasionally, the Harbor Springs Historical Society hosts a fundraising tour of the lighthouse.